With a maximum aperture of f/4.5 at 100mm, the new Sony is not a “fast” lens, but as a 400mm F5.6, it competes with some prime telephotos in terms of lens speed. As a zoom, however, it carries the added benefit of being much more useful. It is also appealing because of its small size. 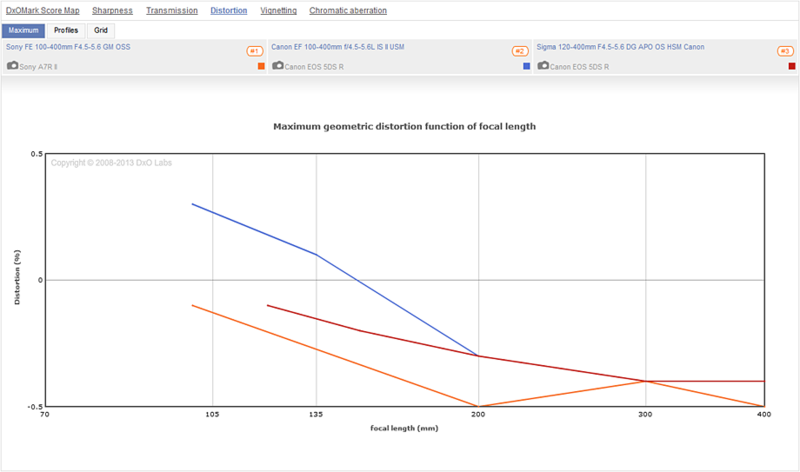 This model uses 77mm filters, and at 205mm (8.07”) in length (not extended), it is very compact. The weight isn’t unreasonable at 1395g (3.08 lb) either, making it not much different in size and weight to a 70-200mm F2.8. The Sony FE 100-400mm F4.5-5.6 GM OSS also features Sony’s sonic-type (Direct Drive SSM) double linear motor for fast and near-silent autofocus down to a useful 0.98m (38.58”) minimum. The lens also has optical stabilization, said to be able to reduce camera-shake by five stops, and adopts a medley of exotic glass types (ED and Super ED) to limit color fringing. Other features of note include a front element with a fluorine coating to make it easier to clean off dirt and fingerprints, as well as sealing to reduce the ingress of dust and moisture. 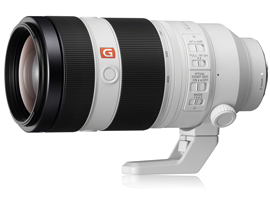 Sony’s longest lens in the lineup, the Sony FE 100-400mm F4.5-5.6 GM OSS performs exceptionally well, especially given that it’s a tele-zoom. 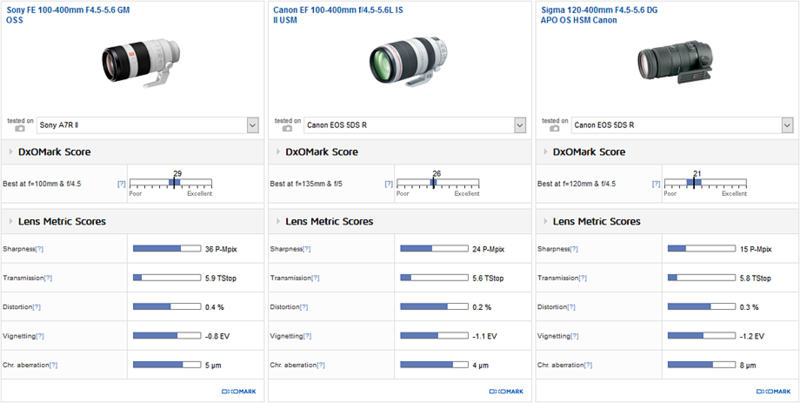 It has very high levels of sharpness, low fringing and vignetting, all helping it achieve a high DxOMark score. 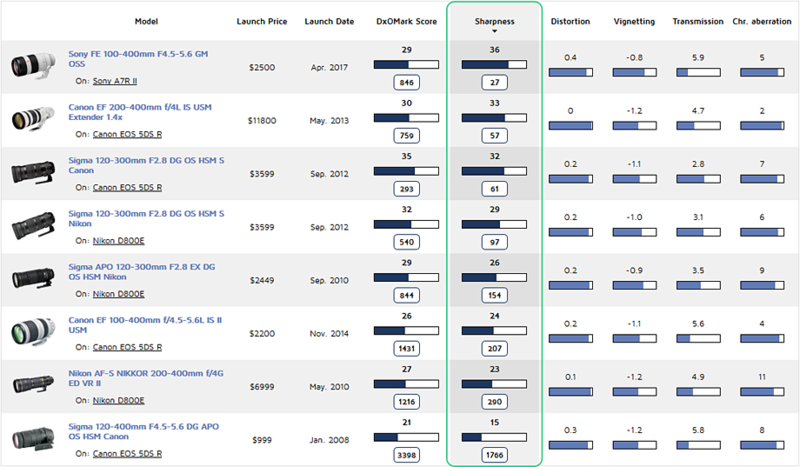 In terms of optical performance, it outperforms the popular Sigma 120-400mm F4.5-5.6 and the Canon EF 100-400mm 4.5-5.6L IS II, and ranks alongside a couple of the pro favorites — the Sigma 120-300mm F2.8 EX DG on the Nikon 800E, and the much pricier Canon EF 200-400mm F4L IS USM. 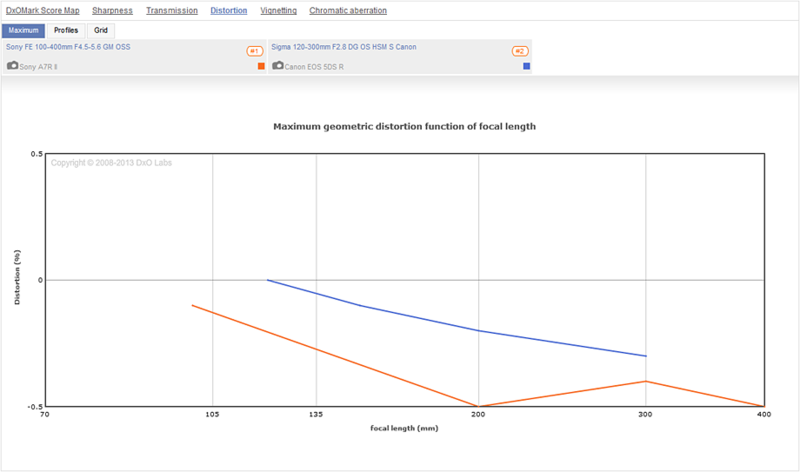 It’s even not far behind the latest iteration of the Sigma 120-300mm F2.8 (the DG OS HSM S model). More interestingly perhaps, in terms of sharpness levels, it outperforms them all, even those mounted on the Canon EOS 5Ds R with its higher pixel count sensor. While the new Sony is sharp wide-open across the central 20% of the frame, dropping a little in the mid and outer zones, that’s at 100mm, where you would expect a tele-zoom lens like this to perform well. At 300mm, image sharpness is very good centrally, but sharpness drops somewhat towards the outer zone, though it’s still good for a tele-zoom. What is surprising, however, is that Sony somehow has managed to improve on sharpness at 400mm. While it’s not any sharper centrally, it has more uniform sharpness across the frame than at 300mm, with the outer zones at a similar level to the center. As no one buys a lens like this to use at mid-focal lengths only, that’s pretty impressive. Distortion at 0.5% would be a little high for prime telephoto, but it’s hardly going to be an issue with most subjects, particularly so with sports and wildlife. 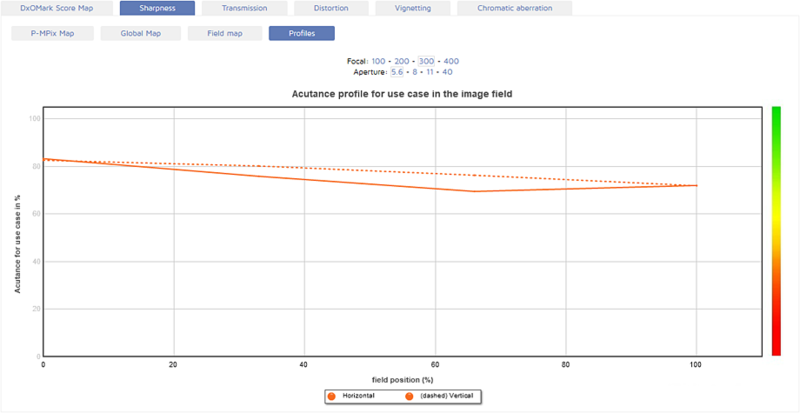 Vignetting is low at –0.8 EV, but it’s not so much the measured peak values that affect the overall score, but rather the overall effect. At 400mm, vignetting is noticeable in the mid and outer zones. In most cases, however, vignetting can be removed easily enough using software. Much the same can be said about the peak values for lateral chromatic aberration. 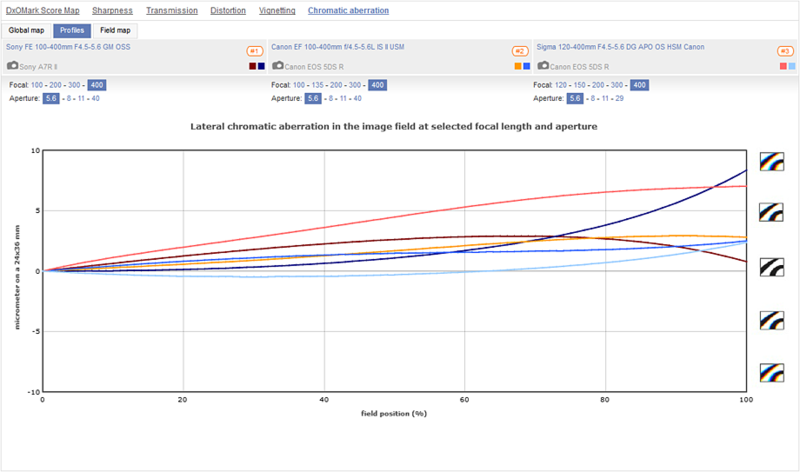 With a measured maximum of 5 microns, lateral chromatic aberration is very low at all focal lengths and aperture settings. If we must say anything at all, there’s a slight increase noticeable around 200mm wide-open; but overall, the lens is exceptionally well-corrected for lateral chromatic aberration, particularly at the longer focal lengths where it can be problematic in lenses like this. Compared to the Canon EF 100-400mm 4.5-5.6L IS II, which has very similar specifications, the Sony FE 100-400mm F4.5-5.6 GM OSS surpasses it in overall performance, even if it doesn’t quite have the excellent uniform performance of the Canon over the focal range. Still, the Sony delivers significantly higher sharpness levels at both ends of the zoom range when wide-open, including the vaunted 400mm focal length and matches it in-between. Stopped down, the Sony is sharper at every focal length. In terms of lens transmission, the Sony is slightly slower at T5.9 versus T5.6; and the Canon has slightly lower levels of distortion and chromatic aberration overall. 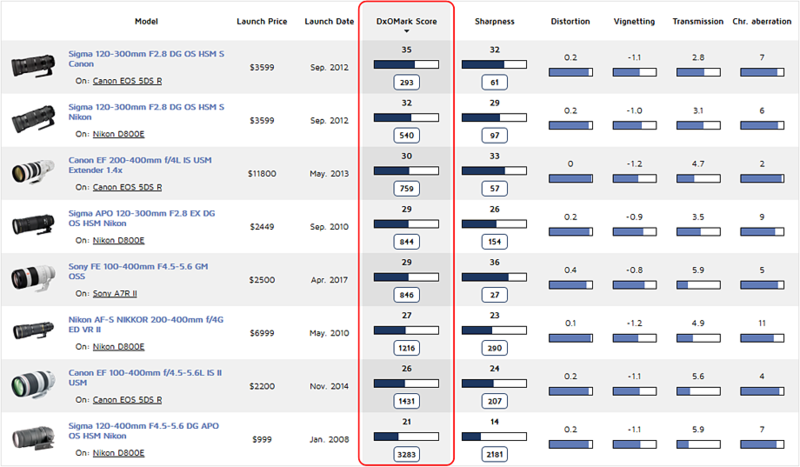 However, all these things are relative, and the Sony offers better overall image quality at a similar price. Against the Sigma 120-400mm F4.5-5.6 DG APO OS HSM mounted on a Canon EOS 5Ds R, the Sony easily surpasses it in most of the metrics. At the all-important 400mm focal length, the Sigma’s sharpness falls off rapidly, and although low in general, there may be noticeable lateral chromatic aberration across the whole frame. 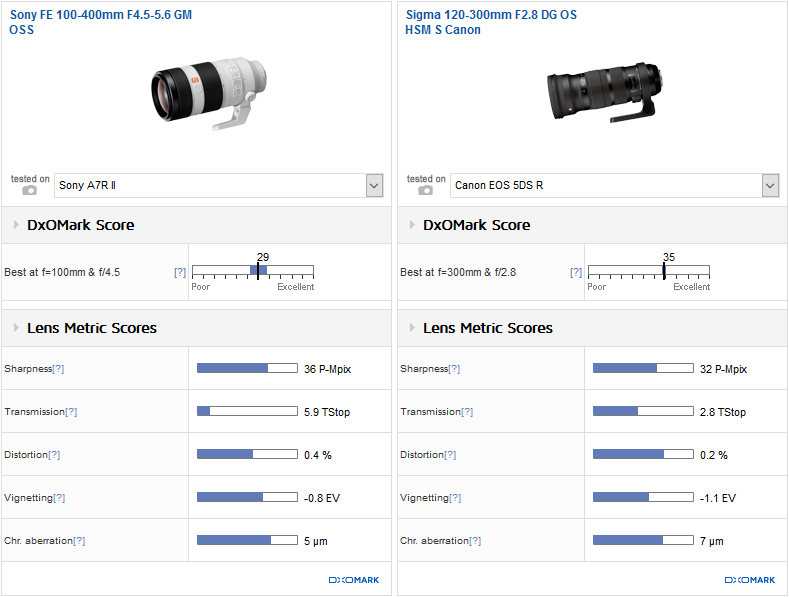 In comparison to the Sigma 120-300mm F2.8 DG OS HSM S when mounted on the 50MP Canon EOS 5Ds R, the Sony comes very close in overall performance, but its lower lens transmission and less uniform performance over the focal range results in the lower overall score. Nevertheless, even with the 42MP Sony A7 RII’s slightly lower pixel count, the Sony lens has significantly higher peak sharpness over much of the Sigma’s equivalent range, with the latter rivaling the Sony only wide-open at 300mm. The Sigma has better control of distortion; both show pincushion only, but Sigma’s levels are very low at the shorter end and increase throughout the focal range. 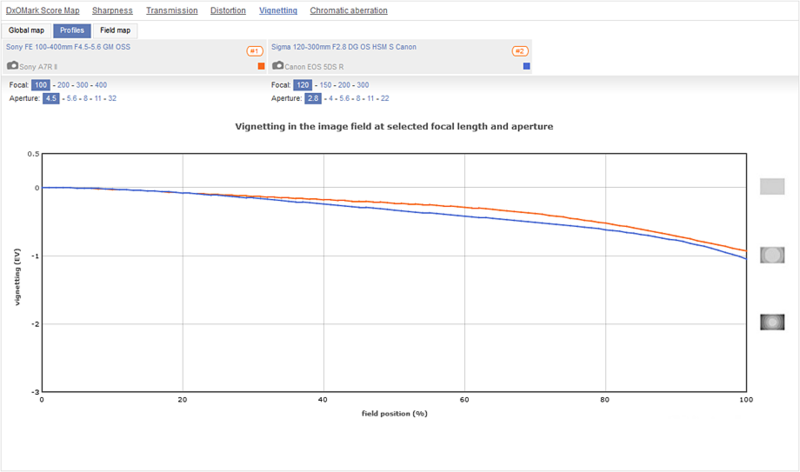 Not surprisingly, the Sony has lower vignetting, and the same can be said for lateral chromatic aberration — though to be fair, both perform well. Telephoto zoom lenses like this tend to be quite large and unwieldy, and are inclined to be sharper at the shorter end of the zoom range. They also often have troublesome chromatic aberration that contributes to the decline in image quality, particularly at the longer end (where you need it the most). While there has been some slightly improved performance in more recent models, such as the Canon EF 100-400mm 4.5-5.6L IS II, Sony’s new FE 100-400mm F4.5-5.6 GM OSS stands out not only for its seismic shift in sharpness, but also for being not much different in size to the FE 70-200mm F2.8. Best of all, perhaps, is that for once there’s a tele-zoom that offers seriously impressive image quality at that prized 400mm focal length.